Whether you like it, love it or hate it, whether you agree or disagree with its philosophy or purpose, there’s no denying the fact that Klout and other social influence scoring sites are changing the way we all think about online influence and social media. This is the overarching theme of Mark Schaefer‘s latest book, “Return On Influence – The Revolutionary Power of Klout, Social Scoring, and Influence Marketing”. There is a simple reason for the meteoric rise of social scoring sites like Klout, Peerindex, and the newest kid on the block, Kred. They promise to keep a running score on something that’s inherently elusive and extremely difficult to measure in any quantifiable way: How likely is it that you will affect behaviour and actions related to a specific topic? It’s pretty easy to see why this would be valuable information to have. Being able to identify key influencers around specific topics would give businesses and individuals much greater ability to communicate precisely focused messages. There is of course a great deal of debate around whether such a thing is actually measurable, and whichever side of that argument you fall on I’ll leave you to decide. Ultimately though, the perspective presented in this book will provide insight in to how the algorithms calculate influence scores, the different ways certain actions will affect your score, and how businesses are using these sites to their advantage. 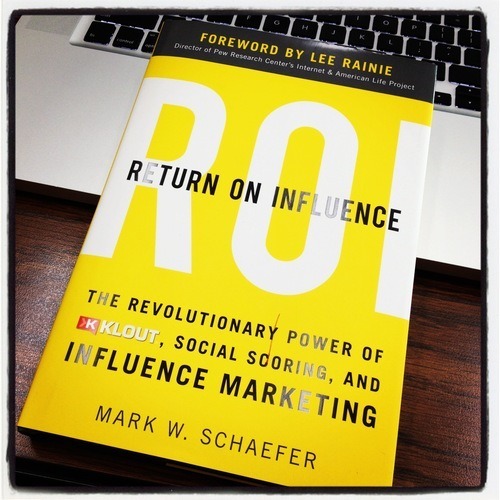 Mark Schaefer does an excellent job in this book by looking at the popularity of Klout, PeerIndex and others as a simple reality of today’s online world. The bottom line is: These sites exist. If trends continue, it’s clear that they aren’t going away anytime soon, so you’d best understand what they do, how they work, and what they can mean for your business. Schaefer presents both sides of the story through relevant anecdotes and personal experiences. You’ll hear stories of tremendous success along side stories of people gaming the system and being discriminated during job interviews because their scores aren’t high enough. You’ll also hear how social scoring companies like Klout are constantly working towards more effective measurements and minimizing the chance that the system can be gamed. Social scoring is in its infancy, and as a result it’s sound advice to keep an open mind about it. Given the frequency with which new communication tools have appeared in recent years, I don’t think that anyone can guarantee a prediction about how the business of social scoring is going to play out. But this book gives clarity to some very muddy waters. Overall, Return On Influence is an excellent read, and it will certainly give you pause to rethink your position on influence scoring, regardless of whether your for it or against it. Note: This review was not solicited in any way, and my copy of Return On Influence was purchased. There’s been a great deal of talk recently about how the current iterations of ‘influence’ measurement don’t really measure the actual influence that individuals have over their followers. What they were really doing is simply extrapolating the amount and type of social media activities that the individual engages in, and then repackage them as a superficial measure of influence. For a while though, it’s all we had to use as a yardstick to compare how we were performing in the world of social media communications. Now, Klout has introduced the +K system, which allows users to manually apply ‘influence’ to individuals based on certain topics of interest. It’s a definite step in the right direction. Now, rather than simply be based on the raw numbers of tweets, followers, and mentions, someone can be marked as influential on a topic based on their CONTENT and the effects that they have on their audience. In my opinion, this is a far more reliable measure of how influential someone is. Of course, there are loopholes and ways to game the system. The first one that I’ve seen rear its ugly head is people flat out asking their followers to give them +K points. Really? Doesn’t this completely defeat the purpose of the +K system? If your followers don’t take it upon themselves to give you +K on their own volition, perhaps you’re not as influential on your topic as you may think you are. This got me thinking about what would really be a good reason to give someone a bump with +K. Should you just give them to your friends? Should you give them to the most popular users in hopes that they notice your action and return the favour? Possibly. But maybe, just maybe, we should be selective in who we give influence points. After all, don’t the people we recommend provide insight in to who we are and what we’re all about? If someone said they are influenced by some loudmouth malcontent who just posts drivel and garbage, my opinion of them may decline a little bit. Who we look up to is indicative of how we strive to be, so in the long run excessive generosity with +K points could reflect poorly on you. If someone continually posts articles that you absolutely must read, they may be deserving of +K. If they have a lifestyle or philosophy that you admire, they may be deserving of +K. If someone you follow is generous in their community, helping everyone without thought of reward, they may be deserving of +K. If someone you follow is dedicated to a charitable cause, and advocates for those who cannot advocate for themselves, they may be deserving of +K. If you ask a question, and they give you a solution that you can use, and it works, they may be deserving of +K. If you take an article they wrote and actually apply the concepts to your everyday life, they may be deserving of +K. If they continually win at anything they do, sharing the stories of their success as they go, they may be deserving of +K. If their customers/clients continually win as a result of working with this person, they may be deserving of +K. If they share a new idea or concept that stops you in your tracks and say ‘WOW’, they may be deserving of +K. If they constantly surprise you with solutions to problems never before considered, they may be deserving of +K. Does giving Barack Obama +K for politics do anything for anyone? Not really. Does giving Starbucks a +K about coffee make others go ‘OK, maybe I’ll try it’? If they haven’t tried it by now, very few things will push them to change. We all want our friends to succeed, but you wouldn’t recommend them for a job they’d be terrible at, so don’t do the same here. If they don’t ACTUALLY influence you on the topic in question, don’t say that they do just to be nice. Everyone has something they’re great at, so if you’re going to give them points, do it on their real topic of influence. It’s a nice gesture, but just don’t. I didn’t give you the +K just to get some from you. I really felt you were influential on a topic so I gave you a bump. If you’re just being nice, then say thanks, or start reading my blog and give me your feedback. Your opinion and comments are far more valuable than a ‘gimme’ to my Klout score. As indicated above, there are those who like to reciprocate when given appreciation, which isn’t necessarily a bad thing, but in this instance it does more harm than good. If you purposely look for those individuals known for reciprocating and give them +K just to get more for yourself, you’re just gaming the system. So there you have it. For the first time, measures of online influence can finally have some kind of ‘meat’ to them. But just like any other metric, they can easily be skewed to the advantage of unscrupulous individuals, rather than used for their intended purpose. I sincerely hope that the majority of users out there really make use of the +K system as the creators of it clearly intended: To place the power of real influence measurement in to the hands of the community. We finally have the ability to effectively gauge influence based on the effects of the content being produced. Let’s not ruin it, ok? Thanks! I have a really hard time putting any kind of stock in to a Klout score. It just seems extremely artificial to me. After all, a quick look at those with scores of 100 yields an awful lot of pop music personalities, whom I shall not name because they clearly do not need any additional referrals. Klout strongly believes that these individuals hold a massive amount of influence, but the question remains: What are they influencing people to do? Retweet their stuff? Buy their song on iTunes? Big deal. Above and beyond that, the real influence of celebrities doesn’t really amount to too much. One can easily argue that individuals who are ‘experts’ on a particular topic have far more actual influence than celebrities, because they often post blog articles and advice that people will put in to practice, thereby changing the behaviour of their audience based on the information that they share. If they share a review of a web design technique that works, or tips for communicating in the social media world, many followers will heed their advice and put those tips in to play for themselves. This, in my opinion, is a much more accurate description of ‘influence’. But there’s a third group of people who hold ‘influence’ in the digital world. They’re not celebrities. They’re not experts. They are what I call the ‘enthusiasts’. People who are absolutely nuts for whatever it is they are talking about. They live it and breathe it. Whatever it is, it is their passion. It could be cars, PC’s, flowers, web design, photography, woodworking, travel, or antique toys. Everyone is passionate about something, and everything has someone who is passionate about it. These individuals are a new kind of influencer. Finding these individuals and engaging with them can create a brand advocate of far greater strength and loyalty than any well-known expert. After all, if a popular expert endorses a product or service, there is a good chance that there is some mutual benefit coming back to them from that company. Either they got the product for free, or were paid to do a review, or simply got the benefit of being featured on the company’s website. Not to say this is bad, because most popular experts got to where they are by being good at what they do. They evaluate products and services very methodically, and tend to have broader experiences to draw comparisons from. But an enthusiast? They probably paid for whatever it is out of their own pocket. There’s something to be said for having super-passionate enthusiasts interacting with you, sharing their opinions and reviews, and becoming your best friends. Social media amplifies their voices and creates a whole new level of word-of-mouth. Someone with 200 followers who’s crazy about your company tweeting about your stuff for weeks (or months) on end can have far more reach and influence than a single tweet in the daily stream of an expert to an audience of 30,000. Ultimately, if you are carefully checking Klout scores and looking at follower counts in order to determine if mentioning or responding to a specific individual is ‘worth your time’, you may be missing out on a huge untapped resource of ‘influence’. Every single person who mentions you is worth your time. You never know who’s voice will really carry the farthest in the social media world.